Removals Company Dorchester, Woods Removals Dorchester Ltd. 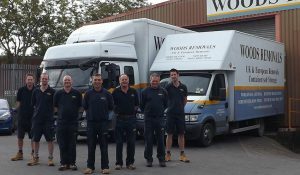 Removal companies in Dorchester just don’t come better than Woods. Maybe it’s the 140 years of experience that’s behind us. Perhaps it’s our sincere dedication to the craft of moving. Or maybe it’s the fact that we’re fully BAR-accredited (British Association of Removers), ensuring that you get certain standards that you can’t always find elsewhere. Whatever it is that makes us stand out, we’re glad that we do and we look forward to moving you without the stress, the slog, the fatigue and exhaustion that may have characterised your moves in the past. From the moment our estimator visits you and takes down all the details of your move, you’ll be glad you made the choice to come with us. The clear, accurate quotation we supply you means no hidden extras pop up and sting you further on in the proceedings and you can relax, safe in the knowledge that your move will be seamless from beginning to end; you’ve found a removals company in Dorchester that knows what it’s doing and has been doing it for well over a century. We know the area like the backs of our hands, too, so no time is lost trying to find your destination point and dithering on the road. We can help with any and every aspect of your move. Sometimes, packing up can be the hardest part, so why do it yourself when you don’t have to? Our packers are well-trained experts who come with every last piece of equipment needed to do a perfect job. If you’ve got complicated items like pianos or valuable works of art, we’ll handle them with care and use just the right packing materials to keep them safe. We use special cardboard crates for mirrors and picture frames so that they’re protected from harmful bumps and knocks. Everything will be loaded and secured in our vehicles so no harm can come to it on route. If you find you need storage in Dorchester then you’re in luck because we do that too, and we do it well. Our facilities are safe, clean and secure.